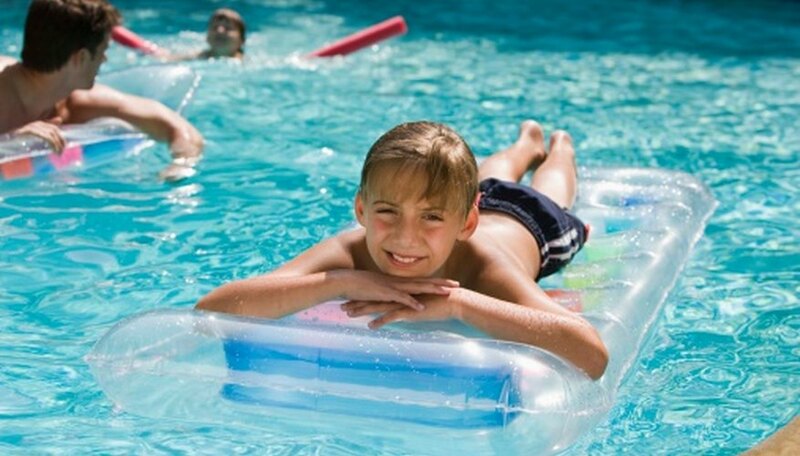 Pool water hardness measures the level of calcium and magnesium dissolved in the water. Too much calcium leads to buildup of scale on the walls and floor of plaster-finished pools, as well as on filtration components. To reduce hardness, drain some of the pool water and replace it with fresh water. Alkalinity indicates the resistance of water to changes in pH. High total alkalinity turns the water cloudy, causes scales to develop and makes it difficult to change the water pH. To reduce alkalinity, add acid to the water. Take a water sample from a depth of at least 12 inches from the water surface. Add a reagent from a hardness test kit to the water sample and check the result against the guide provided by the test kit manufacturer. Follow the manufacturer's instructions to complete this test. Generally, maintain a water hardness level of below 400 parts per million (ppm) and never let the hardness level reach 600 ppm. Drain some of the water in the pool if the water hardness level is too high. Add fresh water to replace the water you remove from the pool. Collect another sample of the pool water and conduct the hardness test again to check that the hardness is between 200 to 400 ppm. Collect a sample of the swimming pool water, using a container. Add the alkalinity indicator from the alkalinity test kit. The indicator usually produces a blue or green color when alkalinity is present. Add the reagent from the alkalinity test kit and count the number of drops it takes to change the color of the water sample to a reddish, amber color. Check the result against the guide that comes with the test kit to determine the alkalinity level of the pool water. Generally, alkalinity should remain below 120 ppm for pools with inert liners and below 125 ppm for pools with plaster-finished surfaces. Pour full-strength muriatic acid into the deepest part of the pool. Pour about as much muriatic acid as you'd need to fill a basketball, but don't add more than 1 qt. of muriatic acid per 10,000 gallons of water. Test the total alkalinity of the pool water. If the level is too high, repeat the procedure daily until total alkalinity reaches below 120 or 125 ppm. Replace the reagent for alkalinity test every year because old reagents provide inaccurate results. Wear rubber gloves to protect your hands from acids.